Holy Hundredth Would You Read It, Batman! Today marks the 100th week! The 100th brave person to post their pitch! The 100th Wednesday of Wonderfulness when we all get to learn so much from each other! Who would have thought we’d get to 100 back on July 27, 2011 when we had our very first pitch? 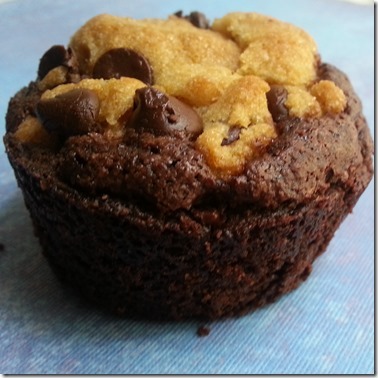 This, my friends, is a Brookie – a Brownie Cookie – pretty much the best of both worlds, don’tcha think? Because the 100th day of anything doesn’t come around all that often, I think I will give away a prize to one lucky randomly selected commenter from today’s post! Just because I love you and my blog would be nothing without all you wonderful people who come to read and comment and share your love of kidlit. Hmmm…. what should the prize be, I wonder? Well, you can never really have enough picture books, can you? 🙂 If you’re a parent or a teacher they come in super handy. If you’re a writer, you can learn so much from how a good one is written. So how about the prize shall be the winner’s choice of Is Your Buffalo Ready For Kindergarten by Audrey Vernick (perfect for this time of year), I Haiku You by Betsy Snyder (perfect for poetry lovers), Journey by Aaron Becker (perfect for art lovers), America’s Champion Swimmer: Gertrude Ederle by David A. Adler (perfect for nonfiction lovers), or, if you already have all 4 of those, something else that we pick together! I like this and can’t think of anything to make it more appealing. It states the problem succinctly and resolves it satisfactorily while intriguing an editor to want to find out what’s inside that backpack. Straight From The Editor reminds me that I don’t think we’ve done the July Pitch Pick, so maybe I’ll put that up on Friday. The Pitch: The sight of a golden egg creates quite a stir among the feathered community and the fact that it doesn’t hatch has the Whisperers working overtime. But have no fear, the Eggsperts are called in to save the day. But do they? In the end, Mother Hen knows she must listen to her heart. Through a humorous story, lies a nurturing tale about a mothers love, acceptance and healing. Please send YOUR pitches for the coming weeks! For rules and where to submit, click on this link Would You Read It or on the Would You Read It tab in the bar above. There are openings in September which is alarmingly close, so please send your pitch in right away for your chance to be read by editor Erin Molta! Lisa is looking forward to your thoughts on her pitch! I am looking forward to seeing how my freshly updated website and blog turn out. The marvelous Donna Farrell is hard at work trying to update, freshen, and streamline my blog and website with only the barest, minimal, cryptic information from me – such comments as, “Can you make it so it does that thing like, you know?” – very specific, detailed instructions 🙂 Good luck, Donna 🙂 But she’s a genius so I know it will turn out exactly how I want it! Have a wonderful Wednesday, everyone! And don’t forget, one lucky commenter today will win a prize! 🙂 Thank you all for your devoted readership! It makes me happy to be part of this warm-hearted, generous community! A Friday Short And Sweet… Because Why Not? The Pitch: Mother Hen has laid a golden egg, but why doesn’t it hatch? Her feathered friends are all a-cluck and call in the Eggsperts to help. Does Mother Hen listen to her friends or her heart? Hello, my friend! I'm glad to see you again and hope you had a wonderful time in Maine! I'm glad you got a chance to unplug – I really think we all need it! Thanks for your helpful thoughts for Lisa. And I saw you had a new post up but my internet's been down all day and I'm way behind. I'll be over as soon as I can! Hello and welcome, Delighted! I'm so glad you stopped by! I would love to be able to deliver the Brookies – I'll get Coleen on the case 🙂 Thanks for your comments for Lisa – I am sure she will find them helpful coming from a first grade expert like you! Lisa, it's wonderful to have a fellow sociologist in the writing community! I got my degree in sociology. I loved your pitch. It's quirky and fun and makes me want to read your book. Susanna, that cupcake brownie just made my mouth water. I must have chocolate soon! Congrats on reaching the 100th WYRI, Susanna. That's such an achievement! Thanks for the encouragement, everyone. I was delighted with Erin's response to my pitch. I am definitely thinking of sending The Backpack Secret out on submission. Lisa, based on your pitch, I'd want to read the story. I actually liked the tone and concept in the first two sentences. But I agree that it's a little long and maybe not specific enough. I'd like a hint at how the Eggsperts will save the day. The part about Mother Hen seems too vague to me. Also, I'm wondering about the Whisperers and who they are and whether they have a big enough role in the story to be mentioned in the pitch? Just something to think about. Thanks, Cally! I so appreciate you being such a devoted reader and commenter on WYRI! Thanks for your comments for Lisa! Congratulations again on your awesome pitch, Andrea! And thanks for your helpful insights for Lisa! Yes to the pitch (an eggs-tra big yes? )–and Happy 100, Susanna! Yay! Good job, Lisa. I like the enticingly humorous tone of your pitch. In my house, one cannot ignore a funny chicken story with puns! Using “In the end” seems like you're telling us the ending and the use of a question doesn't necessarily create suspense, so why not combine these two? Will it be the Eggsperts or Mother Hen who saves the day? Blah, blah, blah the solution lies in listening to your heart. Y'know, something like that, but better. 'Can't wait to see it in print! Thanks, Joanne, for the Happy 100th, the congrats for Andrea, and your helpful suggestions for Lisa! No worries about the day – anytime is helpful. And my internet was down yesterday too. Terrible, isn't it? Puts you so behind! So, Martha Stewart has a recipe…but I made Betty Crocker gluten free brownie mix and divided it into a 12 cup muffin tin and then dropped a ball of BC gf chocolate chip cookie mix dough on top. Then I baked it at 375 for about 20 min. 🙂 Basically you can use your favorite brownie and cookie dough recipes/mixes. Easy! I would read it! It piques my curiosity. I think the pitch might be stronger with a slight variation from what you have. After “But have no fear, the Eggsperts are called in to save the day.” I would change it to something like: “But who knows better, them… or Mother Hen?” (Just an idea). Good luck! My older son is a bit of a chicken whisperer. A lot of kids we know whose families raise chickens are often really good with them too. What else is there for farm kids to do? LOL! Wam! Bam! 100 pitches? Wow! This pitch certainly sounds interesting. With the Whisperers, the Eggsperts and Mother Hen it sounds like a YA dystopian novel! Consider whether all those characters are needed in the query.